Yeah, I know. I’ve been trying very hard to get some things done around the house before school starts for me, so there has been little time to sit down and do a blog post. If you haven’t already, you could friend me on facebook… Most times I have a little bit of time and will do a short little update there if I don’t have time to do one here. I wanted to share the biggest project I’ve been working on…Halloween costumes! 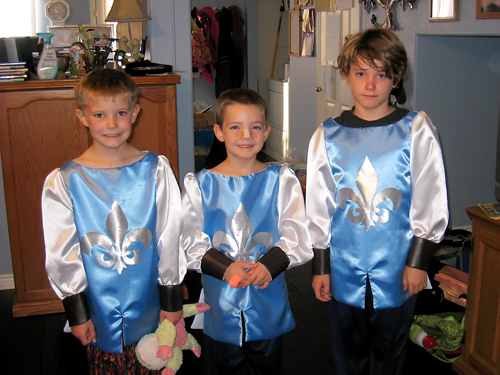 I’ve got the boys’ costumes 95% done. I’ve got a few little finishing touches I need to get together or make, but I made them try the tops on this morning. Contrary to the look on Tyler’s face, they were all tickled to put these on. They all went running to find swords! A little aside about Benji’s nose… My sweet boy has a terrible habit of picking at scabs. We’ve had to take some more drastic measures to keep his hands off of the scab that is on his nose and his hand. No nose accidents have occurred. *wink* We are hopeful that within theÂ next couple of days, he will be scab free, and thus nose-band-aid free as well. I’ve got one more week before school starts and about 983,210,198,723,048 more projects. If you don’t see me here, don’t worry. I will be back a week from tomorrow to let you know how my first day goes for sure. Have a wonderful week!! I know they will enjoy them on Halloween Eve. The costumes look great. Thanks for the update I requested. 😉 So do we get to know what your costume will be before it is finished? Love you sis!